~ Welcome to "Oceanview Serenity"! Oceanfront - Watch Sunrises, Whales and Sea Otters - Walk to Lover's Point Beach. 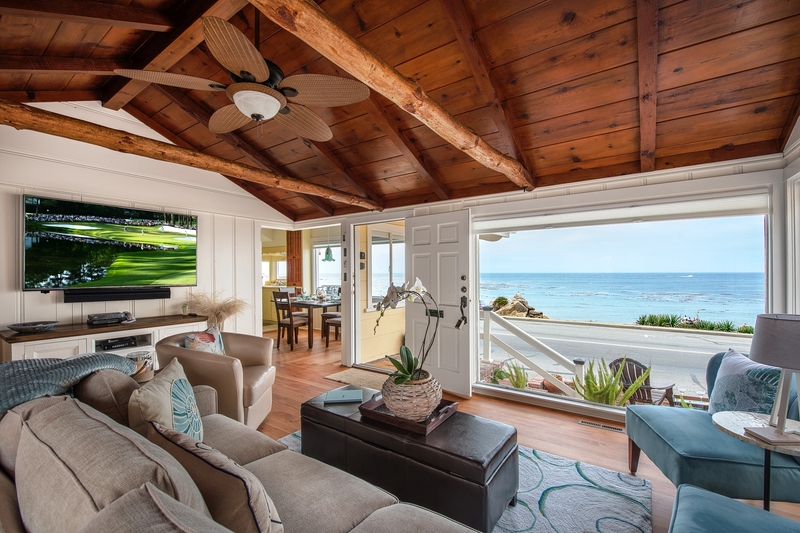 ~ Vintage Pacific Grove oceanfront cottage, beautifully restored. All new furnishings with a charming seashore theme. ~ Vaulted ceilings with old log beams - Beautifully restored hardwood floors and bead-board wood walls. 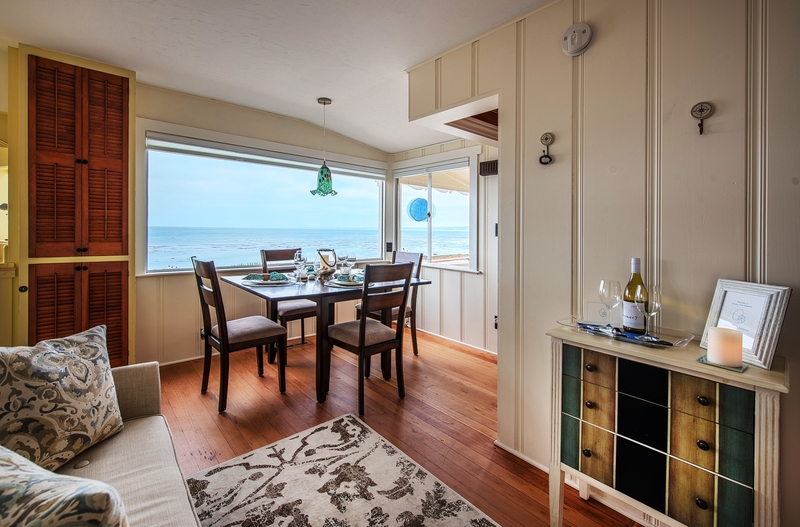 ~ Stunning 180 degree ocean view of Monterey Bay from all the windows. ~ Look for whales and watch the Sea Otters at play while you dine. ~ Walk to award winning restaurants, art galleries and unique one-of-a-kind shops. ~ Wine and cheese to welcome you! ~ Charming vintage kitchen beautifully restored. ~ Master bedroom has a new plush bed queen bed with luxurious linens. ~ Master bedroom has soothing colors of the sea. ~ Master bath has a shower over a bath tub. 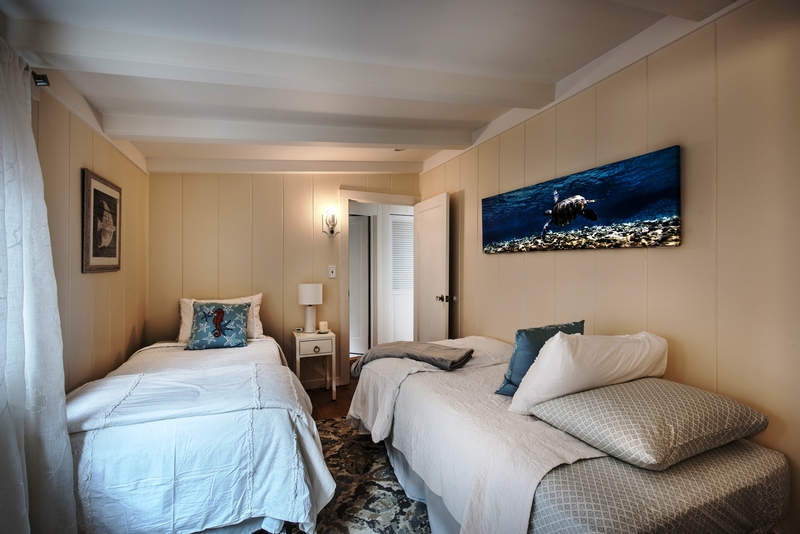 ~ Guest bedroom has new plush beds with luxurious linens and can be either two twins or a king with a memory foam topper. ~ Guest bathroom with a shower. ~ Right out your front door is the oceanfront walking and biking trail that goes for miles along the coast. ~ View from the home looking west; enjoy the sunsets! ~ View from the home looking east; enjoy the sunrises! ~ Backyard dining for six. ~ Spacious backyard has a gas BBQ. ~ Relax and enjoy the sounds of the surf as you dine al fresco. ~ "Oceanview Serenity" - relax and enjoy the stunning views and sea life from this charming, restored vintage cottage. ~ ~ View from the home is similar to this! ~ From the cottage, walk to the Monterey Bay Aquarium. ~ Look for Sea Otters through the cottage's windows. ~ Walk to Cannery Row and the Monterey Harbor. ~ Just a short drive to Asilomar Beach State Park. ~ View from the oceanfront walking and biking rec trail. ~ More beautiful views along the coast. ~ Pebble Beach and the stunning 17 Mile Drive is just a short drive from the cottage. ~ Along the beautiful coastline. 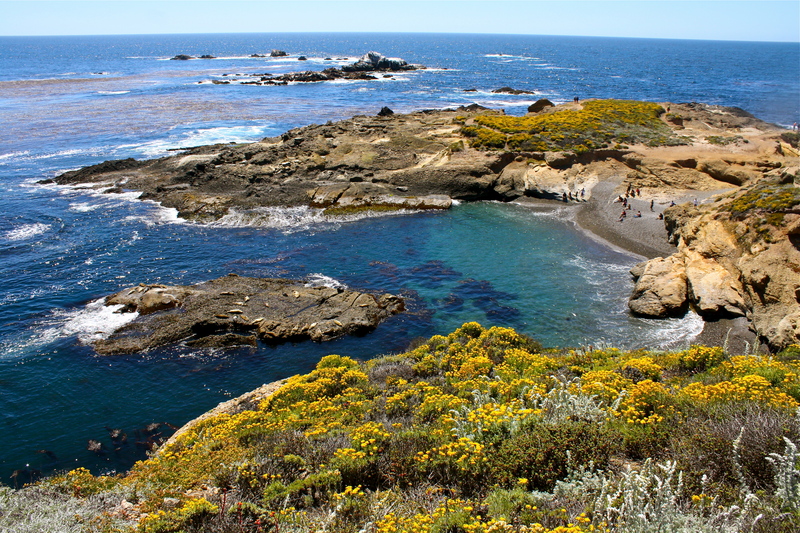 ~ Point Lobos State Park is just a short drive away from the cottage. ~ Point Lobos State Park. 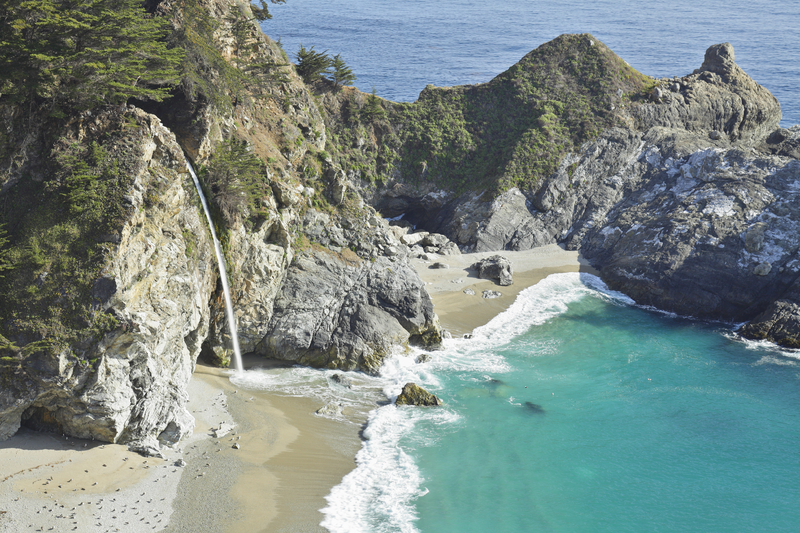 ~ Big Sur is a stunning 30-45 minute drive down the Hwy One coastline. Welcome to Oceanview Serenity! Home sleeps up to 4 guests including children. 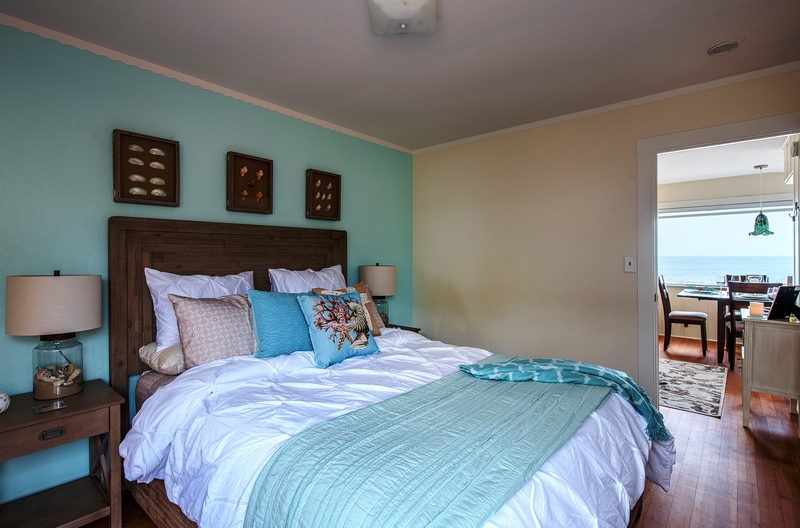 Oceanview Serenity has been recently updated and completely furnished with new beds, furniture and decor. We look forward to reading reviews from our first few sets of Guests to stay at this darling beach cottage. Be among the first to enjoy this delightful home! 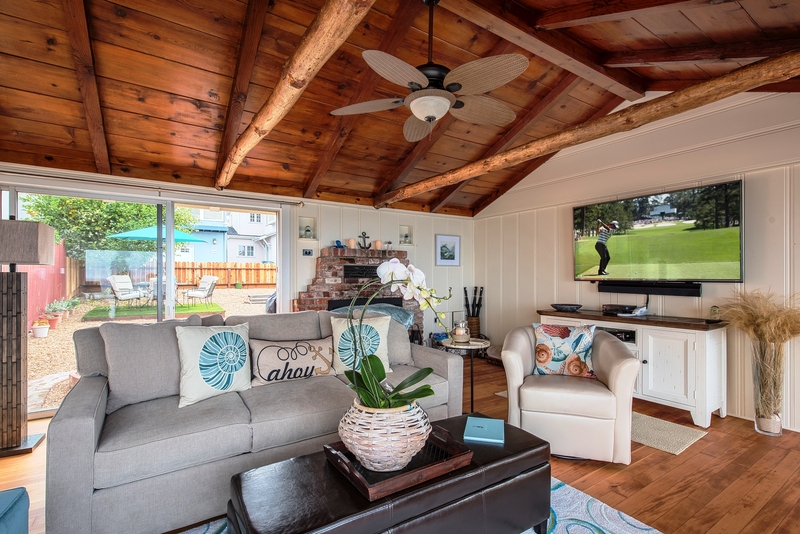 A charming cottage with a stunning 180-degree view of the Monterey Bay offers the best of all worlds in Pacific Grove — close to the beach, but also an easy walk to downtown Pacific Grove, historic Cannery Row and other attractions. 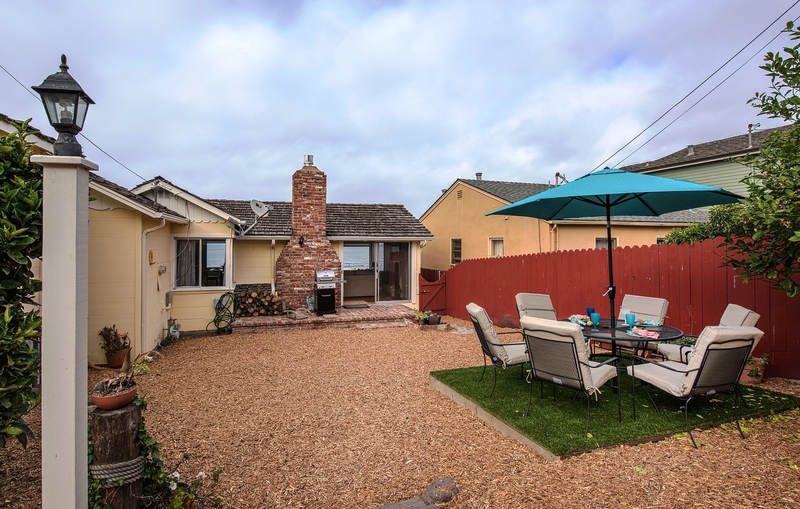 The 930-square-foot pet-friendly home (one small dog up to 15lbs) is directly across the street from the beach and the Monterey Recreational Trail, and is just a few steps from spectacular Lover’s Point. The restaurants, galleries and shops of downtown Pacific Grove are just a 5-minute walk away, and there is also easy access to Asilomar, 17-Mile Drive, and the highly rated Pacific Grove Golf Links. 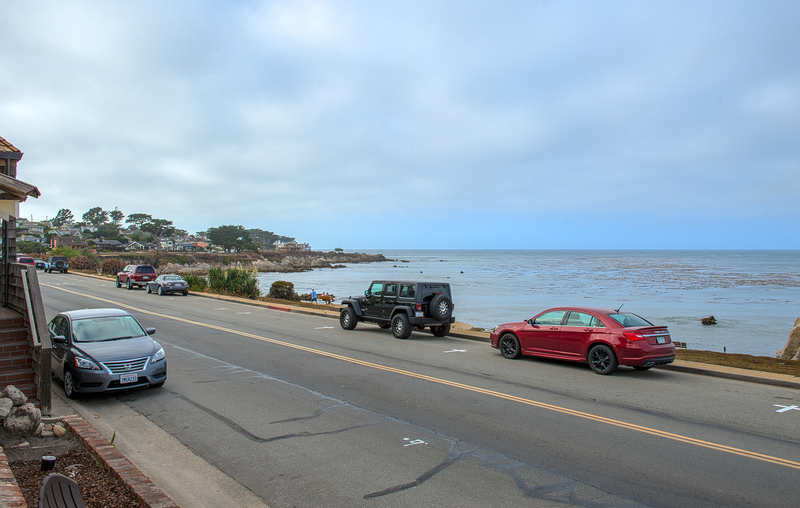 It’s also a short walk to Cannery Row and the Monterey Bay Aquarium, or 10 minutes by car to downtown Monterey, 10 minutes to shopping in Carmel-by-the-Sea, and 15 minutes to golf and fine dining in Pebble Beach. The 2-bedroom, 2-bath home built in 1934 has been recently painted and redecorated to enhance its vintage charm. A brick pathway leads to the front door, past the adirondack chairs that are a perfect spot to sip morning coffee and drink in views of the bay at any hour of the day. Inside the home, a cozy living room and dining room feature large picture windows, taking advantage of the spectacular view, and guests will be able to see boats, birds, and even whales out on the water. 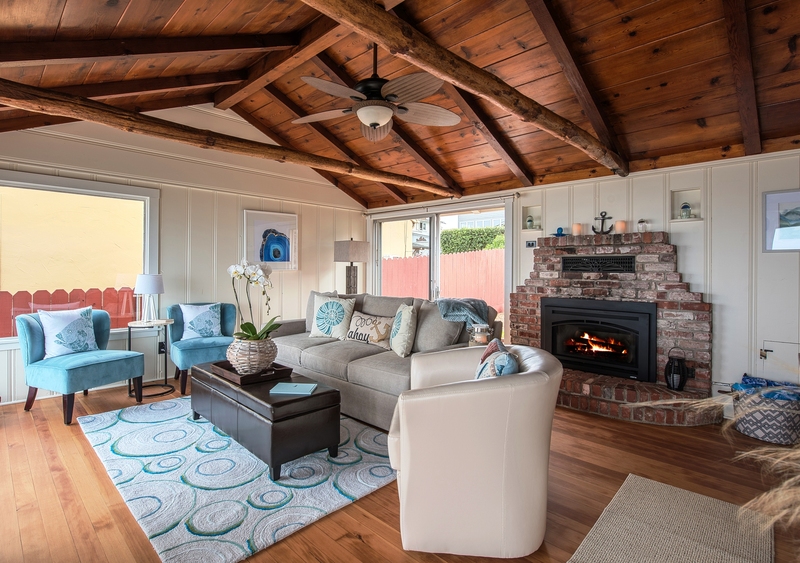 Beach-themed décor in soothing shades of blue, sand and driftwood brings the outdoors inside, harmonizing with the rustic living room that features a vaulted wood ceiling, 65" Ultra HDTV with a connected sound bar and blue ray DVD and a gas burning fireplace. Upholstered chairs and a comfortable sofa provide a place for conversation, reading or playing games, or just sitting and enjoying the bay vistas. Hardwood floors and board-and-batten walls can be found throughout the home, as well as vintage lighting. 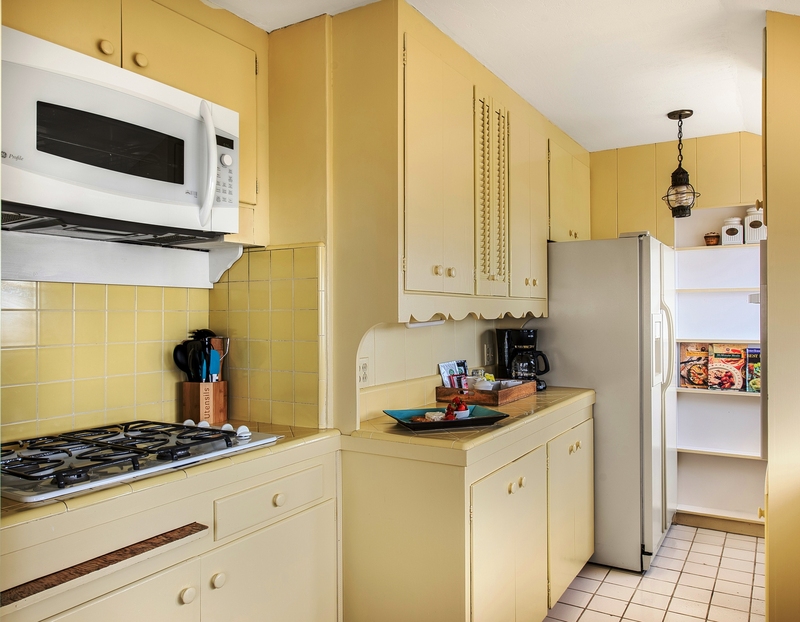 The sunny kitchen is also a pleasant reminder of past eras but enhanced with new appliances, including a gas cook top, wall oven, and dishwasher. The adjacent dining room table that seats six is also next to a large picture window. The master bedroom features a queen bed and a large closet. 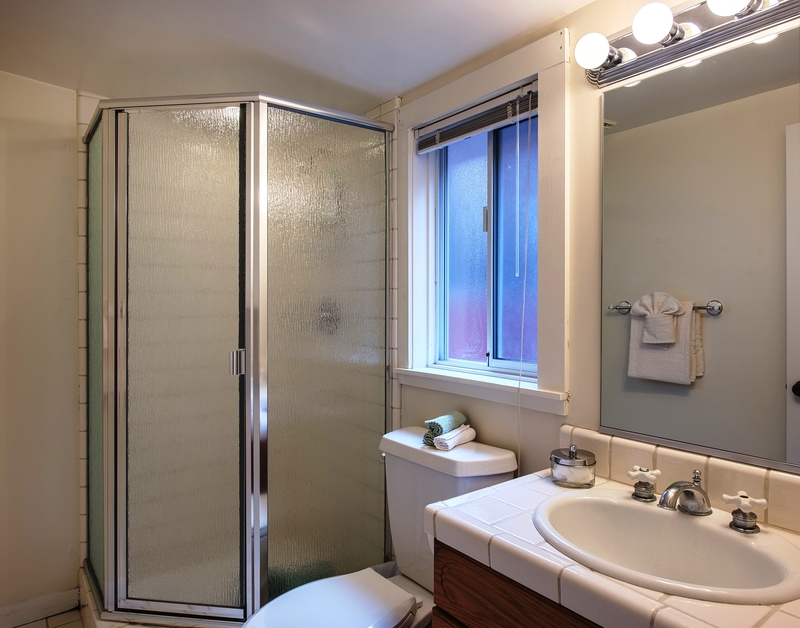 A bathroom with combination tub/shower is adjacent to both bedrooms. The second bedroom contains a king bed that can be converted to two twins, as well as an attached bathroom with a shower. Guests can also enjoy the large fenced backyard, where a gas grill and patio seating are perfect for al fresco dining. The outdoor space is sunny and protected, with views of the bay visible through the home’s picture windows. At the rear of the house, a one-car garage offers space for parking a vehicle and for stowing beach gear. Additional parking is available on the street. 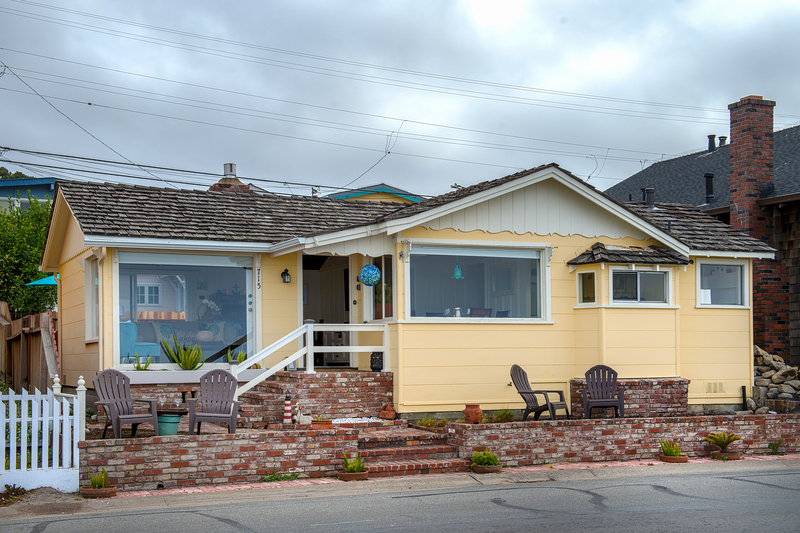 As of May 1st 2019 this home will be available for monthly rentals only as the Short Term License is being revoked by the City of Pacific Grove in an effort to limit the number of short term rentals in the city. The homes which had their license revoked were selected by a random lottery held at the City of Pacific Grove offices on May 22, 2018. *This home may accommodate up to two small dogs less than 25 lbs each for an additional fee. * Total occupancy (including children & infants) may affect rates. * May 1st 2019 this home changes to monthly rentals only. The Short Term License (selected by a lottery) is being revoked by the City of Pacific Grove to reduce short term rentals. * This home is managed by Sanctuary Vacation Rentals. "Beautiful view in a very comfy setting. This property is very well maintained and spacious enough for a family. The backyard is awesome for little dogs, no way for them to escape. Great for our toddler too. 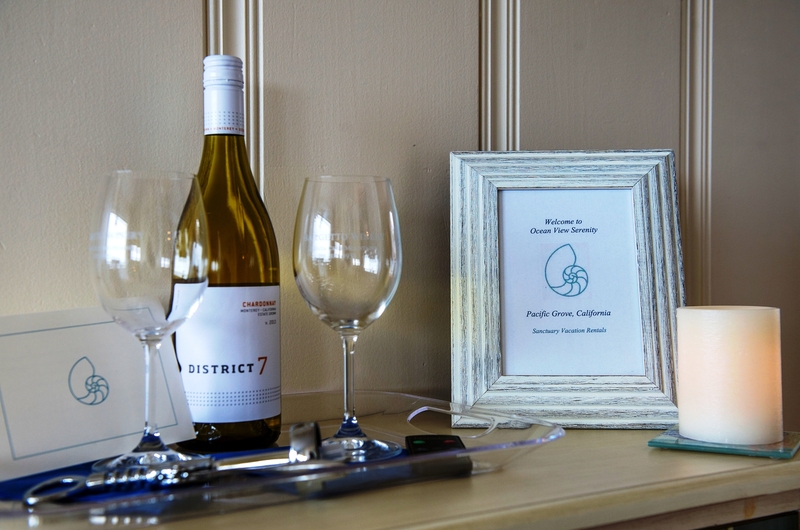 You are steps from Lover's Point beach and restaurant which make this home the perfect place to stay. The view of the ocean from the dining and living room are amazing. You simply cannot go wrong staying here. The bed was super comfortable for a back or side sleeper. The close proximity to the supermarket or Cannery Row make this a wonderful spot to spend a vacation. We would absolutely stay here again. We thank the owner's for sharing their beautiful home with us and others." "Cozy little house with wonderful views! We had a very nice stay at this cozy little home right across the road from the ocean. We watched whales breach as we sat at the kitchen table. Pretty special!" "Great location right on the beach! You can not beat the location of this house. You are directly across from the beach with amazing views while eating breakfast at the table, sitting on the couch in the living room, or in the chairs out front. Just a short drive from food, golf, and the aquarium. We would definitely stay here again if back in the area." "Best vacation ever! This house is without a doubt the best home we have ever rented. It is small but has everything you need and your front yard is the Pacific Ocean. We will definitely be back." "This is a beautiful cottage. This cottage is just wonderful. My daughters and I hated to leave. The views are amazing, the location perfect. Management made sure we were comfortable and had everything we needed. This is a little gem...you won't be disappointed. We look forward to coming back!" "Perfect Vacation Home! A wonderful home with incredible views of Monterey Bay. The living areas offer continual views of the kelp forests and sea otters, along with binoculars to zoom in on spouting whales. The fireplace took the chill off in the morning (a furnace is also available), and open windows kept the house comfortable later in the day. The kitchen is well furnished; we had breakfast, and half of our mid-day and evening meals there. Beds were comfortable, dressing closets very handy, and bathrooms were well stocked. The washer and dryer in the garage were appreciated. After a day of viewing tide pools, driving down PCH 1, going whale watching, or hiking around the bay, having tea in the living room and still enjoying the view is marvelous. Thank you for sharing your home." "Amazing Views and Super location! It was such a nice ocean view from this House. We walked every day along the path across the street and very good resturants within a few block. Perfect for two couples." "Pacific Grove - awesome! The location and view couldn't be any better. We sat on the chairs out front everyday. Everything is really comfortable and there is a lot of closet space too. It's an older house but very well maintained. Backyard is an added feature and the washer machine and dryer worked well too! I was happy hanging out at the house and taking walks from there. We took our little senior dog and she loved going across the street and exploring on the paths. Property managers are great! So close to anything you want to do. Walked to town & Cannery Row. Close to 17 Mile Drive etc." "Five star views. House is well kept and staff is excellent! We stayed here for 8 days and had a fabulous time. The views from the house are spectacular and all we had to do is cross the street to access the paths along the shore. We saw seals, whales and lots of birds. The flowers were blooming all along the coast. 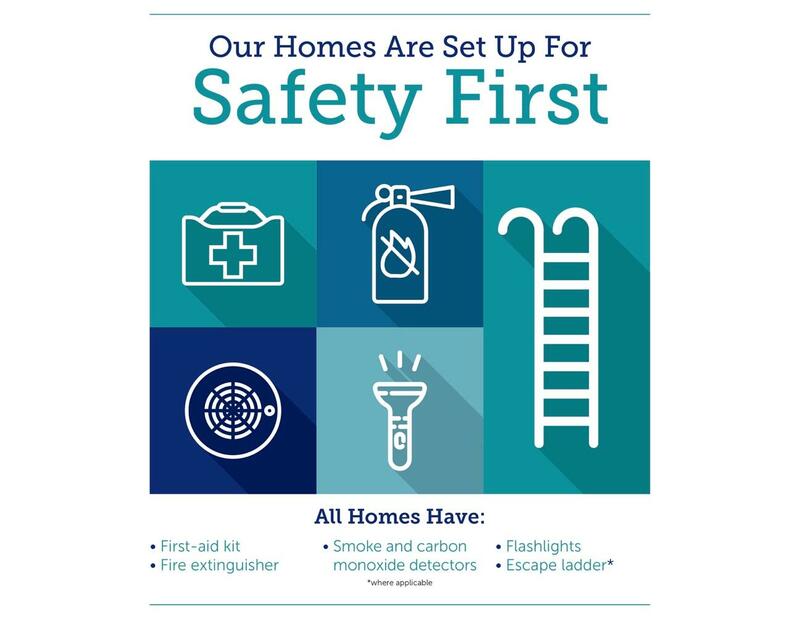 The house has everything you need. We couldn't give it five stars because we have stayed in more modern and roomier houses. The furniture decor is relatively new and attractive, but there were no comfortable places to sit and watch TV. The beds were very comfortable. We plan to return." "Great location, charming house! The location was perfect, right in front of walking paths along the shore. We watched the seals play and had a whale sighting. Parking was on the street but not a problem. The beds were comfortable and the gas fireplace appreciated on the cool nights. We were very pleased with the house." "Pleasantly Perfect Place! Loved this quaint little cottage with the unique view. Not only is it directly across the street but the view can be enjoyed from the comfort of the couch, also! Did they happen to mention that a sunrise (which is unusual for the west coast area) can be viewed from bed with the master bedroom door open. How awesome it was! Everything you could want for an enjoyable stay is not left to chance." "Amazing!!! Wonderful stay, darling beach house! Sanctuary Rentals is a great management company!" "Better than advertised, and we'll be back! This house was exactly what we were looking for. It's a bit on the small side, but perfect for the 2 couples that shared it on this visit. The amenities were as described, we had a bit of trouble with the fireplace but the house manager was willing to come out and look at it (we told her not to worry about it). And that was the end of our list of "negatives", because the place was exactly as described. It was clean, well-stocked, and perfectly located by the water and Lover's Point Park. Setting up the rental was a breeze, communication with the staff was great, and I can't stress the view enough. We were planning to go whale watching and 2 whales appeared about 1/2 mile offshore, well within the range of the binoculars provided with the house. We were able to put off the boat ride for another day! Walking distance from both the Aquarium/Cannery Row and the shops and restaurants on Lighthouse Ave. A SHORT drive from everything else. You get the picture - we were extremely pleased. We look forward to experiencing this house and this staff again." "Charming home, breath taking views every day! Overall, this sweet cottage with perfect amenities and well stocked with all the necessary supplies made our stay relaxing and worry free. While VBRO had nothing to do with the weather, we loved the place rain or shine. The beauty is beyond belief from every front facing window. The big screen TV a plus! Everyday there were wonderful surprises with birds, whales, harbor seals and then ever changing surf crashing against the rocks. Being close to stores, restaurants and shopping is great. Of course the season of the Monarch butterflies is also I nice touch. We loved our stay, and we plan to return." "Lovely cottage overlooking the Pacific Ocean. The house is beautifully decorated with comfortable, soft sheets and plenty of additional bedding and towels. The backyard is set up with a grill and a comfortable dining set which made for plenty of outdoor dinners. We ran out of gas in the middle of grilling and the property mgmr Julia responded on a Sun (over memorial day) with a full tank to save the day! We will definitely be visiting again! Only downside: unlike most homes we have rented in the area, it does not come with passes to the aquarium." "Fantastic location, location, location! Just the perfect size for four adults to enjoy a long weekend getaway. Comfortable furnishings and sounds of the crashing surf across the way makes this a great destination for relaxation. We were able to walk everywhere and enjoyed sitting out front of the house in the evenings. Lots of special touches and was delighted by all the "green" cleaners and Trader Joe's items in the shower. We would definitely go back and highly recommend this home to others." "Simply wonderful! Waking up in the morning and enjoying a cup of coffee sitting in front of the huge floor to ceiling window was a truly magnificent way to start each day! Then of course there was wine time in the evening.... Having the opportunity to enjoy seeing the Pacific Ocean throughout the day was exactly the peaceful retreat we wanted for our vacation. The cottage was exactly as portrayed in the pictures and was exceptionally clean and all very usable space. We will most definitely be back-thank you!! Honestly felt as if I was on a cruise ship with the great view and location but could walk out the front door and walk for miles along the ocean. Highly recommend." "Excellent Vacation Home! This home exceeding our expectations. 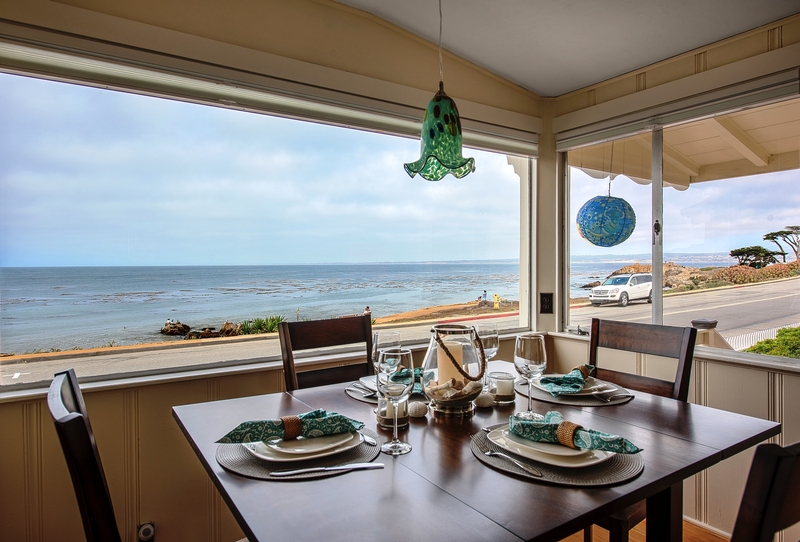 We highly recommend it to anyone looking for a vacation rental in the Monterey/Pacific Grove/Carmel area." "Magical! We stayed at ocean view serenity shortly after the holidays for a short visit and thoroughly enjoyed it. The owners thought of everything we could possibly need and the location was perfect. The house was beautifully and tastefully decorated. We travel to the area fairly frequently as we love the beauty and serenity of it. Would love to come back for a longer stay as soon as we can. Thank you for sharing this wonderful home with us." "Lovely home and a beautiful location! We had a marvelous time staying at this beautiful home. Highly recommend it!" "Beautiful cottage with heavenly view! We stayed for 5 days over the Thanksgiving holidays. The house is impeccable, with every amenity anyone could want. My daughter brought her medium sized dog, and the yard worked well (although she ultimately figured out she could jump over the front gate - be warned). The dog is crate trained and so we left her in the spotless garage at night. Waking up to the amazing views was the highlight of the trip, we never tired of it. Although small, it has more than enough room for 6 (although they limit to 4)." "Charming cottage with gorgeous view. ! This was a new rental listing. We stayed over the Thanksgiving week and had a wonderful time. Two couples and a dog. Place was warm, impeccably kept and furnished, has everything you could want. 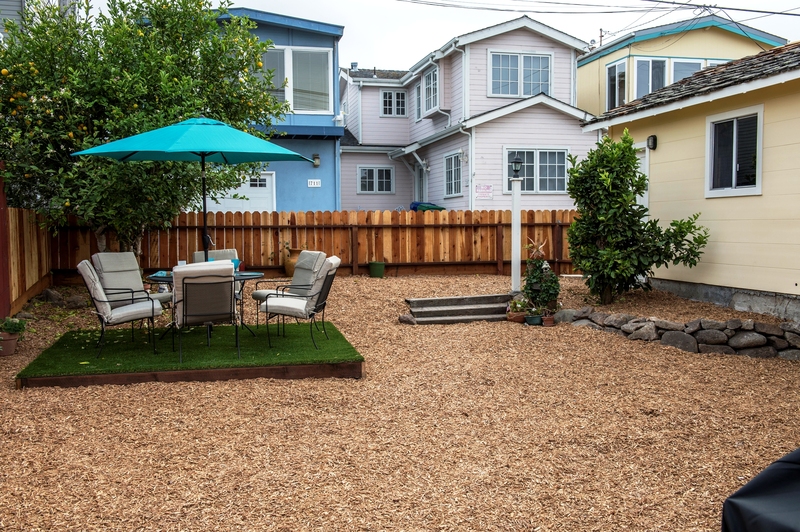 A large backyard for pets, clean garage for very small car or storage. All new and nothing left to chance. Easy to book, easy to get to, easy to love. Very small kitchen but has all you need if you do want to cook." "Stellar view, comfortable and cozy house! We LOVED this house and can't wait to return next year!" "The feel of this home is so very cozy and warm. We were very impressed with every detail and how well equipped." Maximum occupancy - Home sleeps up to 4 guests including infants and children. Note: The Master Bedroom is across the hall from the bathroom with a shower-over-tub. Note: This bedroom has an en suite bath with shower.